Looking for a tasty and flavorful restaurant style fried rice recipe? Here goes the quite popular schezwan fried rice recipe from Indo-chinese cuisine. This spicy hot and delicious fried rice recipe makes a fantastic option when you're craving something to tease your tastebuds for dinner. It gives a deep chilli garlic flavor that is absolutely irresistable. Try this easy video recipe & enjoy! Wash & soak basmati rice for 5 mins. Cook the basmati rice and set aside. In a frypan, heat oil. Add soya sauce, vinegar, salt and tomato ketchup. Mix and allow to cook. Add cooked basmati rice and toss in high flame for 2 mins. Garnish with sliced spring onions and turn off flame. 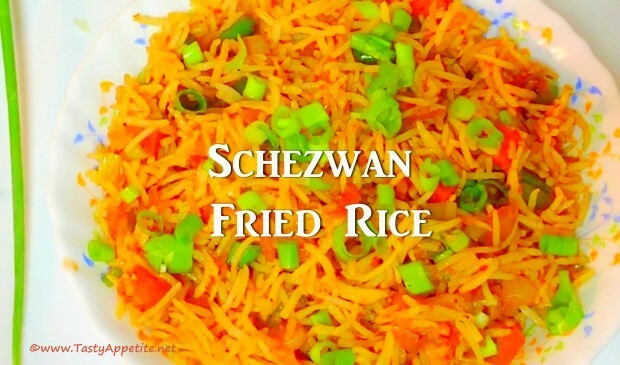 Flavorful, spicy hot and delicious restaurant style schezwan fried rice is ready! Enjoy hot with any curry of your choice.